These textile artists are changing the game. A ’70s-inspired macrame wall hanging is a perfectly nice room addition: It’s a bit boho, but it can still appeal to more minimalist tastes and can even fit in with a contemporary farmhouse-style scheme. But sometimes, a break from tradition is desperately needed. With dynamic colors and innovative textures, the right wall hanging can feel fresh, unique, and inspiring. Your walls are a blank canvas for you to express yourself in your home. Whether you opt for a gallery wall or tapestry, it communicates your personal style. So if you want to fully express your own individuality, sometimes you need something really special, and these textile artists deliver just that. Portuguese artist Vanessa Barragao isn’t just visually inspired by the ocean—she also aims to help protect it by using sustainable design practices in her impressive large-scale creations. She uses recycled materials and scrap yarn to create her tapestries and rugs. Barragao takes commissions for smaller-scale wall hangings, but her massive, room-covering works are a thing to behold. Emily Henderson–approved string artist Nike Schroeder has a way with color. Her custom projects bring a sense of movement to otherwise blank walls, as their individual threads drape loosely downwards. The Los Angeles–based artist often displays her work in gallery shows, but if you’re itching to have it in your home, good news: She takes commissions. Élan B. is a Miami-based artist who works in multiple disciplines: She makes terrazzo using locally sourced marble, graphic prints, and, of course, wall hangings made with sustainable natural fibers. What sets her wall art apart, though, is her experimentation with experimental shapes and designs. Consider them like you would a piece of abstract art, rendered in cozy 3-D.
Trish Anderson certainly has a way with yarn, but her work isn’t knit. The Brooklyn- and Savannah-based fiber artist uses a tufting technique to give her creations an ultra-pleasing varied texture. Using virtually every color of the rainbow, Anderson makes psychedelic designs with her seriously impressive yarn collection. It’s hard to resist such intoxicatingly vibrant works. Fiber artist Meghan Purcell draws inspiration from nature in her earth-toned fiber art, which uses locally sourced wool. Each step of her design method is deliberate—she’s even involved in the shearing process. With mountain-like geographies woven into each piece, Purcell’s vision of the American West is evident, and her commitment to using high-quality, sustainable materials makes her work even more special. 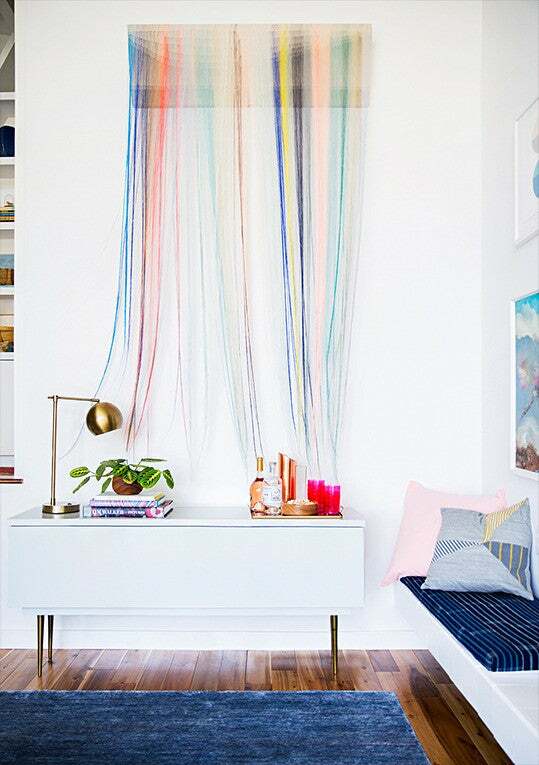 Fiber artist Lauren Hlivka makes perfectly minimalist-meets-bohemian, drape-style wall hangings. Each strand in each piece is hand dip-dyed using nontoxic dye, making them environmentally conscious and lovingly made. Often inspired by elements of nature, Hlivka’s pieces offer a fluidity on a relatively large scale—you don’t need to add anything else to your wall for them to make an impact. It’s time to rethink your houseplants: The most exciting ones might actually be made of yarn. Alyssa Ki’s floral-inspired wall hangings are whimsically looped enchanted gardens that you never have to worry about watering. By mixing up her textile types, Ki creates wall decor with thrilling dimension and charm. Plus, she shares in-process shots on her Instagram, which make the final product all the more impressive. A mix of beading and embroidery enliven French artist Amandine Bouet’s textile work, which frequently evokes images of vivid coral reefs. A little bit of sparkle goes a long way when she contrasts sequins with softer cotton. Her work isn’t just confined to the wall though: She also makes earrings and brooches that come at a more accessible price point but feature all the same mesmerizing details.